High-quality stickers for different keyboards Desktop, Laptop and Notebook such as: Sony, Toshiba, HP, Dell, Compaq, Panasonic, Acer, Gateway, Sharp, eMachines, Ashton Digital's Passport, Averatec, Systemax, IBM, Lenovo, NEC, Alienware, AST, Asus, Samsung, Cybertron, Apple, Macintosh Computers, Power Mac, Apple iBook, Apple PowerBook, Apple iMac etc. 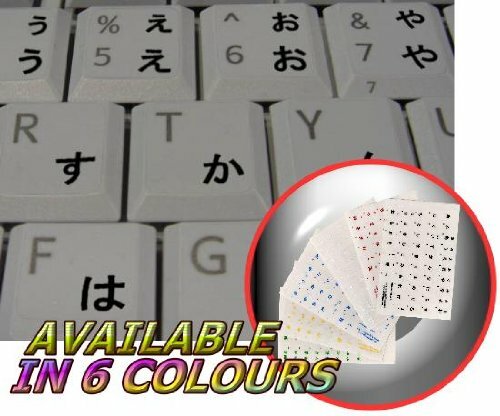 The Japanese Alphabet is spread onto transparent - matt sticker, with black color lettering which are suitable for all light keyboards. Applying stickers on you keyboard properly once, and you can be aware that letters will stay for ever. Transparency and matt hue of the stickers is suitable for all kind of keyboards in spite of their color. It guarantees complete absence of glare under different angels of lighting. Clear transparent background makes stickers invisible, and allows existing characters to show through. You do not have to think how to apply Stickers. You'll know it intuitively. English letters located underneath each sticker - will accurately indicate buttons on with you will apply corresponding stickers. Applying possess doesn't take more than 10-15min. And you can immediately enjoy your brand-new Japanese-English keyboard when making contacts with your relatives, friends and acquaintances. What you're offered now is high-quality stickers, intended to simplify you work and enjoy it while doing it on computer. OUR MOTTO IS - QUALITY! The product listed above is copyrighted, has been manufactured and distributed by Royal Galaxy Ltd.
Usage of the images posted, distribution or resale has NOT been authorized by Royal Galaxy Ltd, and is in direct violation of its written terms. Federal law provides severe civil and criminal penalties for the unauthorized usage, distribution or resale of copyrighted product, its listings with all imaged posted. For all requests regarding usage of images of this product, its distribution and resale, please contact us by email. The big minus for me was that these very thin stickers were on a card that didn't want to let go of them. The first few I applied took several tries to remove with a reasonable length fingernail. After I'd finished the top row, I got the clever idea to peel away the flash that surrounded the stickers, exposing the edges. Then I could fold the card back and easily get the individual stickers loose. I did take care not to peel so far that I couldn't match the sticker to the appropriate letter--the stickers are clear except for the Hiragana character--and I got through the rest of the task in reasonably short order. Note that these stickers are small and meant to fit on the crown of a standard key. I expect it should be fairly easy to line them up and then simply tap down with a fingertip.